under the care of James Spence, Esq., F.R.S.E. Edinburgh : Murray and Gibb. Description : -28 p.,  pl. ; ill., 1 stereo. ; 20 cm. Photograph : stub mounted stereoview card, albumen. Subject : Mandible — Osteosarcoma. Offprint : "Reprinted from the Edinburgh Medical Journal, November 1859." 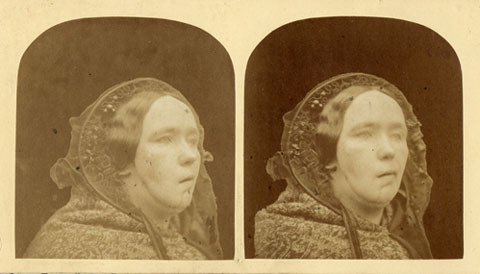 Oval blind stamp on the stereoview : A. ORANGE PHOTOGRAPHER EDINBURGH. Plate size : 174 x 83 mm. André Orange was born in France circa 1810. Spence was appointed Regius professor of surgery at Edinburgh in 1863. The processus lateralis mammae is referred to as "the tail of Spence." Spence was nicknamed "Dismal Jimmy" by his students.